New Delhi: In the matter concerning permission given by the Central Government to the medical colleges in the country, the Supreme Court was seen observing that the recommendations made by the MCI oversight committee cannot be disregarded or left out of consideration in the matter. The Supreme Court directed the Centre to consider afresh the issue of granting permission to several , which have been barred from admitting students for academic years 2017-18 and 2018- 19. Medical Dialogues team had earlier reported that in the month of June, the central government, overruling the clearance given by the MCI oversight committee had banned 32 medical colleges, also forfeiting their security deposit. On the appeal of many of these colleges, the apex court has now asked the government to re-evaluate the recommendations of the Medical Council of India (MCI), the hearing committee, the director general of health services (DGHS) and the oversight committee and grant a hearing to such medical colleges. A bench, headed by Justice Dipak Misra, said the process of hearing and final reasoned decision should be “completed peremptorily within ten days from today” and directed the parties to “unfailingly cooperate” to meet the time frame. “In the above persuasive premise, the central government is hereby ordered to consider afresh the materials on record pertaining to the issue of confirmation or otherwise of the letter of permission granted to the petitioner colleges/ institutions. “We make it clear that in undertaking this exercise, the central government would re-evaluate the recommendations/views of the MCI, the hearing committee, the DGHS and the oversight committee, as available on records,” the bench, also comprising justices Amitava Roy and A M Khanwilkar, said and listed the matter for August 24. The courts verdict came on the plea of some colleges which challenged the governments May 31 order debarring them from admitting students in the two academic years — 2017- 18 and 2018-19, due to several deficiencies. By its May 31 order, the Ministry of Health and Family Welfare cancelled the conditional permission which was granted for establishment of the medical colleges for the academic year 2016-17 on the basis of approval of the Supreme Court-appointed oversight committee. It had directed the colleges not to admit MBBS students in the two subsequent academic years. The oversight committee had on May 14, after analyzing the report of the assessors of the MCI, recommended confirmation of conditional permission to these colleges. The colleges have contended that having regard to the status of the oversight committee and the role assigned to it by the apex court, its recommendations/views by no means could have been disregarded. 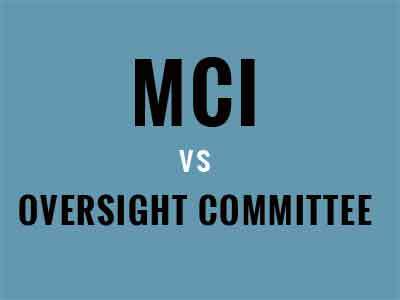 They have submitted that the government had disregarded the views expressed by the oversight committee and went by the recommendation of the MCI which was “grossly unfair and unreasonable”. The bench said that the oversight committee had been constituted by the court and empowered to oversee all statutory functions under the Indian Medical Council Act. It said, “All policy decisions of the MCI would require the oversight committees approval, its recommendations, to state the least, on the issue of establishment of a medical college, as in this case, could by no means be disregarded or left out of consideration. “Noticeably, this court did also empower the oversight committee to issue appropriate remedial directions. In our view, in the overall perspective, the materials on record bearing on the claim of the petitioner institutions/colleges for confirmation of the conditional letters of permission granted to them require a fresh consideration to obviate the possibility of any injustice in the process,” the court said. If permission is given to start a medical college sufficient time should be given to develop infrastructure facilities over a period of time in an incremental manner as the students advance thro course of study. It is unfair to stop admissions on biased opinions and reports. It\’s a good judgement which provides an oppertunity for genuine societies to develop good medical institutions.